Know of a farm who grows Turmeric? Let us know! 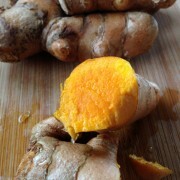 Turmeric used in cooking is the root of the curcuma longa plant and part of the ginger family. The roots are smaller than ginger, light brown skinned with brilliant orange flesh. We are lucky that it grows well here in Hawaii as it is known all over the world for its usefulness in cooking, medicinally, and even as a natural dye. Turmeric root is often boiled, dried or baked and then ground into a powder to be used in cooking as a spice for flavoring or to bring its brilliant golden orange to a dish. It has a warm, pungent, spicy flavor. – Fresh and raw it is a spiced root, warming. It can be grated and added to dipping sauces, dressings or infused for beverages. – In Okinawa, turmeric tea is popular and many believe it is one of the contributing factors to longevity. Ground turmeric or fresh chopped turmeric is steeped in boiled water, lime or lemon and sometimes raw sugar is added to the mix. Look for roots that are firm and free of mold. It stores well in the refrigerator if kept very dry – wrap in a dry paper napkin then seal up air tight.